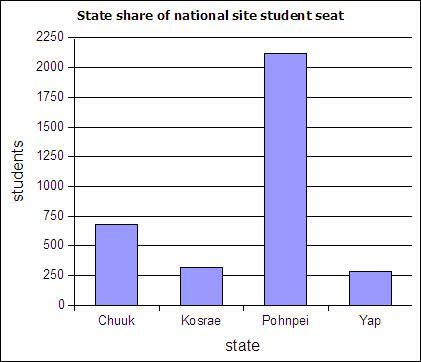 The table below includes FSM census 2000 data and student seat numbers for the national site of COM-FSM circa 2004. In a circle chart the whole circle is 100% Used when data adds to a whole, e.g. state populations add to yield national population. 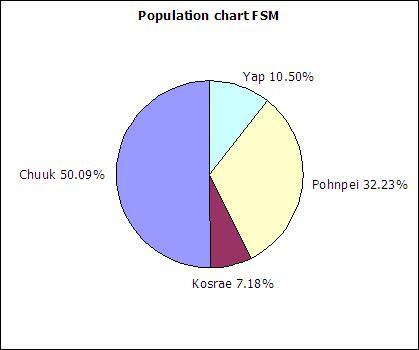 The following table includes data from the 2010 FSM census as an update to the above data. If a column chart is sorted so that the columns are in descending order, then it is called a Pareto chart. Descending order means the largest value is on the left and the values decrease as one moves to the right. Pareto charts are useful ways to convey rank order as well as numerical data. A line graph is a chart which plots data as a line. The horizontal axis is usually set up with equal intervals. Line graphs are not used in this course and should not be confused with xy scattergraphs. When you have two sets of continuous data (value versus value, no categories), use an xy graph. These will be covered in more detail in the chapter on linear regressions.